Women’s Temple Night - Valentine’s Day in the Temple! 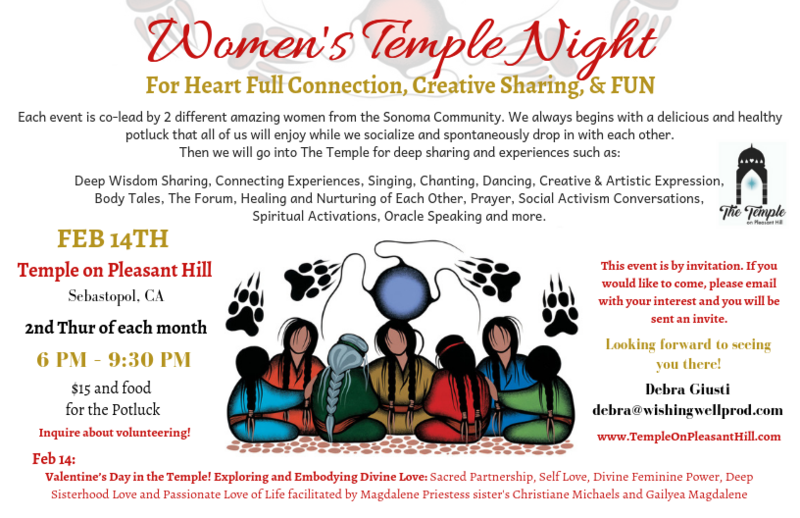 You are invited to join " Women's Temple Night" at the Temple on Pleasant Hill, in Sebastopol, for heart-full connection, creative sharing, spiritual inspiration, sisterhood time, good food and FUN!! Valentine’s Day in the Temple! Exploring and Embodying Divine Love: Sacred Partnership, Self Love, Divine Feminine Power, Deep Sisterhood Love and Passionate Love of Life. Cost will be $15 donation to the Temple and food for the Potluck. 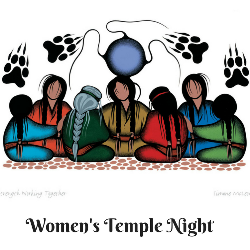 The Women's Temple Night takes place each the 2nd Thursday of the month. It begins with an amazingly delicious and healthy potluck that all of us will co-create. We will have time to socialize and spontaneously drop in with each other. Then we will go into The Temple for deep sharing and experiences such as: Deep Wisdom Sharing, Connecting Experiences, Singing, Chanting, Dancing, Creative & Artistic Expression, Body Tales, The Forum, Healing and Nurturing of Each Other, Prayer, Social Activism Conversations, Spiritual Activations and Oracle Speaking, and more. Valentine’s Day in the Temple! Exploring and Embodying Divine Love: Sacred Partnership, Self Love, Divine Feminine Power, Deep Sisterhood Love and Passionate Love of Life.This will be a beautiful evening with heart opening experiences and rituals to explore and access Divine Love within. Join your Magdalene Priestess sister's Christiane Michaels and Gailyea Magdalene, Sarah Alexandra and many others as we nourish ourselves this Valentine's Day in a deep dive into the true power of Love that sustains our hearts and creates a powerful loving community of Divine Feminine power that nourishes all.